Today we present another in our series of Milwaukee tavern cards. This example, dating from July 22, 1940, is different than the others we've seen, conspicuous by the lack of a publisher's credit. The phone number - Marquette 6857 - is in the same exchange as our Steinel Publishing card from 1932, and the notation "34th Year" lines up with their date, but I can't find the name anywhere. The graphics aren't as much fun as some of the cards we've looked at, but there's a world of information in this beauty. We can start by looking at the American Association standings. This late in July, the Brewers were languishing in fifth place, ahead of only Indianapolis. 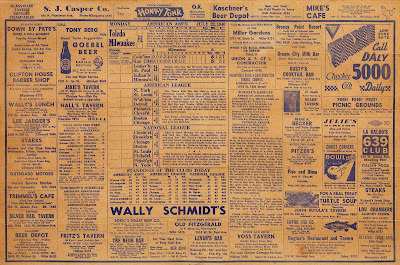 Ray Schalk's debut as the new manager of the Brewers yesterday wasn't exactly a howling success neither was it a complete washout thanks to a seventh inning second game homer by Charlie English with two mates aboard to give the Schalkmen an even break for the day in their twin bill with the Columbus Red Birds. The visitors easily won the first game, 11 to 4. The score of the second was 6 to 3. 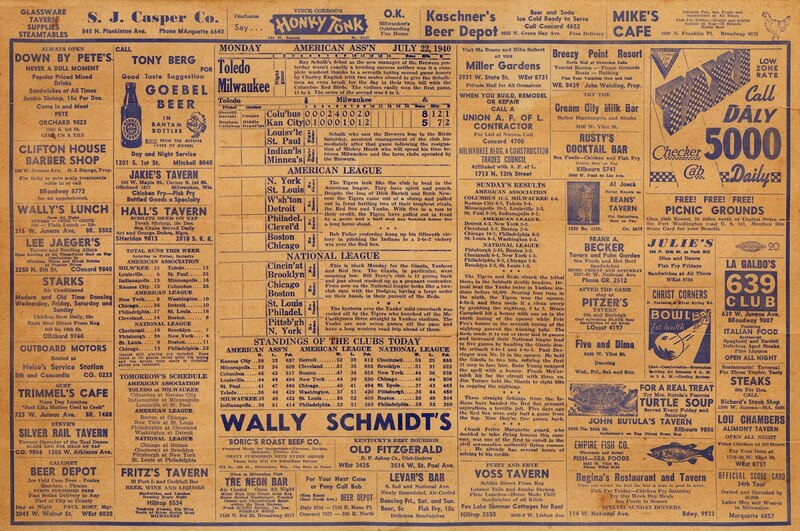 Schalk, who saw the Brewers lose to the Birds Saturday, assumed management of the club immediately after that game following the resignation of Mickey Heath who will spend his time between Milwaukee and the farm clubs operated by the Brewers. Ray Schalk was a popular former Brewer of thirty years previous, one of many big-league players who found his entry to the majors via Milwaukee. He came to the Orchard in 1911 and the following season was sold to the White Sox, where he became famous as one of the honest players on the "Black Sox" squad). Thirty years later, he was brought in as a skipper to take over from player/manager Minor "Mickey" Heath, who was about to transition to coaching and broadcasting with the club. This particular tavern card chronicles an important moment in Milwaukee Brewer history, more than earning it a spot in our Archives.